Did you know that eBay Motors is the number one automotive site on the web? Did you also know that eBay Motors sells one passenger every minute? That’s right, eBay Motors is a HUGE online operation with over 10 million unique visitors each month. 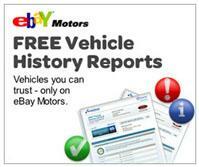 And today eBay Motors announced they will be offering 100% free vehicle history reports for all used cars sold on the site. The only criteria for the free vehicle history reports is that the vehicles must be sold in the US. • Stolen, salvaged or rebuilt. • Turned in under a lemon law. • In a flood or hail storm. • In an accident or fire. • A victim of potential odometer rollback. • Used as a rental or fleet vehicle, or as a police car or taxi.